When it comes to your cattle feeding operation, pounds matter. The more pounds your animal gains in a shorter period means the animal is more efficient and consequently, you should see a greater return on your investment. But what factors influence those gains? Certainly, genetics play a role, but so does the nutrition you provide your animals. You can mate two of the fastest gaining animals together, but if you don’t feed them a proper plane of nutrition, you’re not going to see adequate growth and performance. Nutrition combined with overall animal care, including reducing stress, contributes to efficient gains. “It is vital to provide the right nutrients at the right time to maximize gain. It’s always important to offer a high-quality vitamin and mineral supplement. Even though macro minerals change, trace mineral requirements remain relatively the same through their lifetime,” said Lindsey Grimes-Hall, Nutrition & Field Sales Support for BioZyme® Inc. 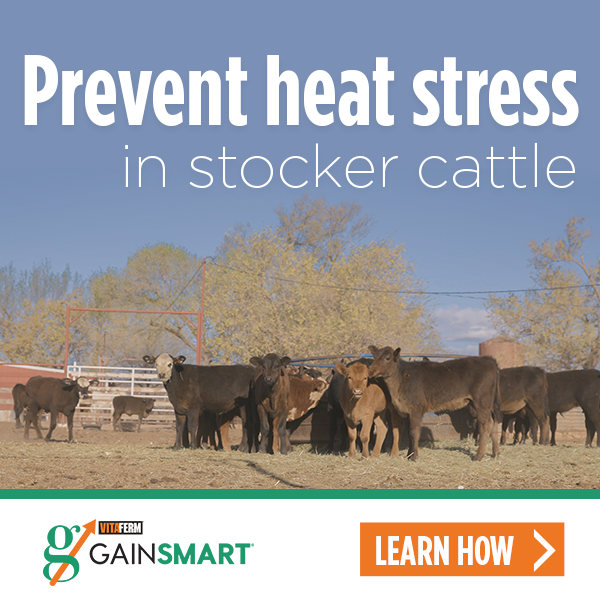 The VitaFerm® Gain Smart® Stocker Program offers a three-step approach to make sure your calves stay healthy and keep putting on pounds efficiently. All three steps of the program include the Amaferm® advantage, which helps increase intake, digestion and absorption, meaning your cattle will get the most nutrients and maximize their gains, no matter the quality of the feed or forage they are on. Amaferm is a precision-based prebiotic designed to enhance digestibility by amplifying the nutrient supply within for maximum performance. Step one is the Vita Charge® Cattle Drench, to be administered within 48 hours of receiving. The Drench provides a jump start on feed and energy intake, stimulates the cattle’s immune system and allows maximum effectiveness of vaccinations. Step two is the Vita Charge Stress Tub, to be fed for at least two weeks. In addition to Amaferm, the Stress Tub contains MOS to help trap the bad bacteria, limiting their ability to do harm. It promotes feed and water intake and increases digestibility to maximize the energy value of feed for more gains. Step three is the Gain Smart mineral, which is to be fed at least 45 to 100 days. Four mineral options exist, depending on the feed or forage your calves are on (Click here to View Options). The Gain Smart mineral will promote calf health and vigor, stimulate digestion and increase nutrient uptake for optimum gain, support hoof health and immunity and accurately supplement those minerals lacking in the pasture and rectify mineral imbalances. Just as important as the Amaferm in the Gain Smart Stocker Program is the trace minerals that are included in the mineral package. Especially in a year like we are just wrapping up where forage might not be as plentiful, the increased intake, digestion and absorption of Amaferm is vital. With lower-quality forages, Amaferm helps get the most nutrients out of those forages. In years with better forages and more lush pastures, the Amaferm will help those pastures last longer, stretching your resources further. Yes, gain is dependent on several factors, but without a good plane of nutrition, your rate of gain is going to be slow growing.